Four people have died after a storm swept across southern parts of Britain on Monday morning, cutting power supplies, causing widespread travel disruption and flooding. A 17-year-old girl in Kent and a man in Watford were killed by falling trees, and a man and woman died after a house collapsed in west London following a suspected gas explosion. The storm, named St Jude after the feast day of the patron saint of lost causes, hit the South West of the country late last night before moving north eastwards across England and southern Wales throughout the morning. UK Power Networks said 220,000 homes in the country were without power after the storm. 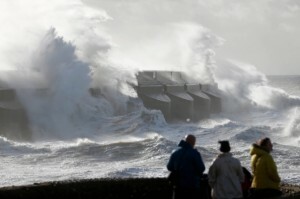 The Met Office said a gust of wind was recorded at 99mph (159km/h) on the Isle of Wight at 05:00 am GMT. Railway companies operating in southern Britain significantly reduced train services on Monday morning and over 130 flights were cancelled at Heathrow airport. The storm also affected government activity with Deputy Prime Minister Nick Clegg announcing on his Twitter that a press conference had been cancelled after a crane collapsed on top of the Cabinet Office. “Today’s press conference moved to a day when there isn’t a crane on the roof and journalists travelling on the train are able to join us,” tweeted Clegg. Transport for London reported severe delays on several lines and suspended overground services causing massive travel disruption to rush hour commuters in the capital.